You are here: Neurological Imaging/Nicholas A. Lazzaro, M.D. 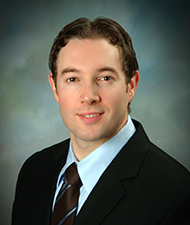 Nicholas A. Lazzaro, M.D. is a graduate of the Indiana University School of Medicine in Indianapolis, Indiana. He fulfilled a Transitional Internship at Oakwood Hospital in Dearborn, Michigan. He also completed his four year residency in Diagnostic Radiology at Oakwood Hospital. Dr. Lazzaro finished a two-year fellowship in Neuroradiology at the University of Utah Medical Center in Salt Lake City, Utah. His works have been published in Clinical Nuclear Medicine as well as Endocrine medical journals and American Journal of Neuroradiology. Dr. Lazzaro enjoys spending time with his wife and family as well as many outdoor activities including hiking with the family dog.